Ku Klux Klan recruitment flyers were discovered in Bridesburg last year. Bridesburg residents are finding KKK recruitment literature left around their neighborhood. Emily Capra, a teacher in Philadelphia, said when she got to work Friday morning and went to get something from her trunk she found a Ku Klux Klan sticker had been put on her vehicle's rear windshield. 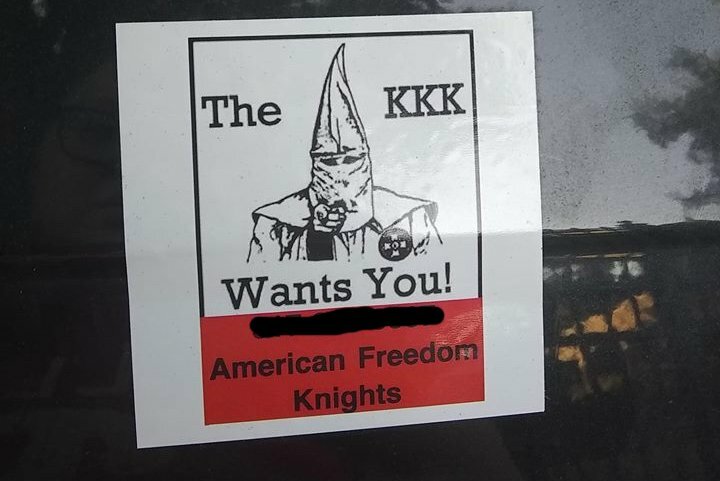 The sticker reads: "The KKK Wants You! American Freedom Knights." It includes a phone number with a Michigan area code, which PhillyVoice has blurred out in the above image, which was provided by Capra. "It's despicable that people are going around in these neighborhoods posting things like this on windshields and houses. How dare you," Capra said during an interview Friday. Neighbors have seen similar recruitment materials seemingly left by the white supremacist group, Capra said, and some have even encountered the individuals distributing the KKK literature. According to another Bridesburg resident, this has been happening for months. That woman, who asked to remain anonymous, said a business card with the same recruitment pitch and phone number had been left on the front porch of her Kirkbride Street home about two months ago. She had to explain to her children, 11 and 13, what the KKK is after the discovery, she said. At a neighbor's Memorial Day party, that woman said she spoke to others in the neighborhood who had found the same business cards left on their front porches. She called the Michigan phone number and said an older man answered. When she verbally confronted him, he accused her of harassment, she said. But when she mentioned she is friends with police officers, his tone of got more timid. He claimed that someone else was putting his phone number on the cards, but then before they hung up, the woman said, he asked her to get in touch if she was interested in joining the KKK. Capra said her brother called the number. No one answered, but the voicemail included a man's name. After he hung up, Capra said her brother received a text soliciting him to join the KKK. On Friday, PhillyVoice called the phone number printed on sticker left on Capra's vehicle and also reached a voicemail. The name in the outgoing message matched the one Capra's brother heard. Capra and her children are part Puerto Rican, and her husband is 100 percent Puerto Rican. The flyers have left her "scared" and "angry." "Do I let my kids play outside now?" Capra wondered, adding that the person distributing the flyers and business cards "could be my neighbor." She added that some houses in the neighborhood fly Confederate flags. "You just try to keep walking by, but you never know," Capra said. "That's the neighborhood we live in." Neither woman contacted police or city officials about the KKK flyers, but Capra said she plans to file a complaint with the Philadelphia Commission on Human Relations. Rachel Hooper, spokesperson for the commission, said while they haven't received a complaint yet from Capra, they are working with police to investigate the matter. She said the commission is going to work with the community to provide information on how to report hate crimes and bias incidents, which can be done by calling (215) 686-4670, emailing pchr@phila.gov or calling the anonymous hotline at (215) 686-2856. "This is the perfect time for the community to come together and express their concerns," Hooper said. The woman who had the KKK business card left on her porch two months ago said when she moved to the neighborhood from Kensington, she had heard there was an issue with racism in Bridesburg, but initially didn't get that vibe; through school, she and her children have become friends with several black families in the neighborhood. But the KKK recruitment materials being circulated show that tensions are high, according to the woman. She said she believes the flyers are targeted at a younger crowd. "Obviously it's getting out to the kids that are weak and very easy, vulnerable," she said. "It's bringing hatred back into the neighborhood."